Thoughts of New Jersey often conjure images of dirty industrial plants, pollution, and corruption, but the Jersey shore comprises an extensive coastline of barrier islands and quaint beach communities, which host throngs of tourists in the warm summer months. 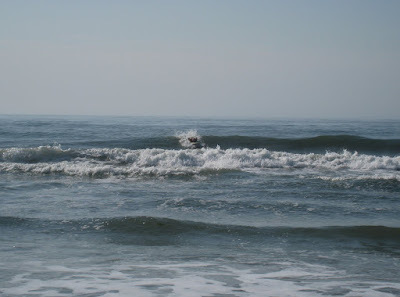 Ocean City, New Jersey, a popular vacation spot with families from the Philadelphia region and less scenic North Jersey, has a surprisingly active group of surfers that scour the lengthy stretch of coastline for the most desirable beach break peaks. The sandbars create various pop-up peaks up and down the coast leaving the line-up seldom crowded and presenting lots of choices to the adventuresome surfer. The crowds of tourists, however, lead to an overly vigilant crew of lifeguards that substantially limit the surf zones. As a popular tourist destination with a much smaller permanent resident base, many of these beach cities have resorted to “beach tags” as a way of generating revenue to fund basic services. Roaming armies of enforcers periodically patrol the beach to ensure compliance. Unless you are spending the entire day on the beach, however, you can easily go surfing without purchasing a tag. The long stretches of coast are littered with public access points and an abundance of free parking. Crowds are rather limited and tend to be concentrated around city centers and the lifeguard towers. A convoluted system of flags ambiguously designates swimming and surfing zones, with unenlightened visitors sure to elicit the piercing shrill of lifeguard whistles as they encroach upon the confusing boundaries. A basic rundown is as follows. Lifeguard towers are regularly distributed along the beach, often close to public access points. Green flags will designate a very small swim zone of approximately 100 feet which is actively monitored by the lifeguards. A larger expanse of beach is demarcated by a red flag on either side of the green flags. This strange region, designated the “dead zone”, is prohibited to board surfers, but will also induce excessive lifeguard attention if an unsuspecting swimmer ventures out of the green flag preserve. Another red flag follows on either side of the lifeguard tower denoting the surf zone. Windy or stormy conditions often result in a roving patrol by a lifeguard on a personal watercraft, which often speeds by dangerously close to the lineup. Ultimately the extent of lifeguard coverage of the surf zone is in question, but there are usually two to three people monitoring the small green flag swim zones and often are eager to inform surfers that they are outside of the approved area. One upside is that the overzealous lifeguards are only on duty from about 10am to 5:30PM leaving the entire coastline open to surfers during other hours. There are a couple of prominent surf shops in the Ocean City area, but both are notably lacking in the availability of quality rentals. 7th Street Surf Shop is located on the tourist infested boardwalk in the north part of the city. They offer lessons and foam board rentals, but seem to cater to beginners with little to no prior surfing experience. All said, the 7th Street Surf Shop would not appeal to experienced surfers and has little to offer. Alternatively, Surfer Supplies at 3101 Asbury occupies a quaint two story storefront that could easily be confused with a residential property. Their rental stock only slightly improves upon that of 7th Street with heavy Bic long boards available for use in addition to the ubiquitous foam board. Surfer Supplies, however, generally has a helpful staff and a number of used short boards at reasonable prices. For extended visits, it would likely be more affordable to purchase one of these boards rather than rent a substandard board or pay usurious fees to transport your board(s) across the country. The owner won’t buy the shorter boards for cash, but may offer store credit if you are inclined to expand your wardrobe or buy other accessories. The younger employees at the shop seem to be more straightforward and can offer good advice. There are limited hotels in Ocean City with the majority of visitors renting condos or private residences. The peak tourist season is obviously the summer when kids are out of school and the air and water are warmer, but the surf in the region will really pick up when hurricanes generate more sizeable swells. It may be possible to find more affordable options during the off-season, but be prepared for water temperatures that fall into the 50s during the fall and freezing temps through the winter and spring. Ocean City, New Jersey and the other beach communities to the south are within a short drive to Atlantic City, home to a range of casinos, entertainment, and dining options. The Borgata is the newest casino in the area and rivals most Las Vegas strip casinos in terms of size and quality.